Yesterday, AT&T came out with their fourth quarter reports and Randall Stephenson, AT&T chairman, CEO and president reiterated that "The ramp in our AT&T U-verse TV service accelerated, and we are on track to reach more than 1 million subscribers by the end of 2008." At the end of the fourth quarter, subscribers to AT&T U-verse IPTV service, totaled 231,000, up from 126,000 three months earlier. AT&T's U-verse TV weekly install rate in mid-December was approximately 12,000, above the company's year end target of 10,000. U-verse to Reach 30 Million Living Units by 2010? AT&T shared yesterday at its analyst conference in New York an updated 2008 and multiyear outlook and outlined its strategies for sustained double-digit growth in adjusted earnings per share driven by advances in wireless, broadband, enterprise, IP data and a new generation of converged services. AT&T also announced a major expansion of its AT&T U-verse services to include the company's Southeast region, with deployment now expected to reach approximately 30 million living units across 22 states by the end of 2010. AT&T expects that its U-verse services will represent a multibillion-dollar revenue stream by 2010. AT&T announces an offer for access to HD programming at no cost for 12 months to qualifying new video customers within AT&T's traditional 22-state service area. New subscribers to AT&T U-verseSM TV service, where it is available, or to DIRECTV Service, and AT&T | DISH Network service who mail in the required redemption forms, are eligible. Through its U-verse TV service and relationships with DIRECTV and Echostar, AT&T is offering access to a leading suite of HD programming, a technology that with capable equipment can deliver rich and realistic video and near movie theater-quality sound. AT&T U-verse TV receivers and DVR are HD-enabled. AT&T claims that U-verse services are available to more than 200,000 Dallas/Ft. Worth-area households, and there are plans to continue growing availability over the coming months. 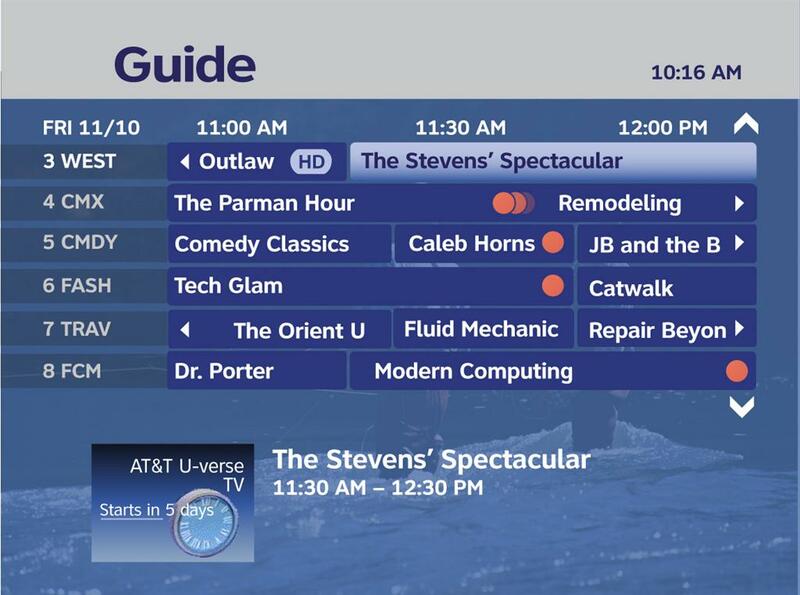 AT&T U-verse TV's unique features have led to significant interest from DFW-area consumers. AT&T U-verse offers more High Definition channels than local cable providers, the ability to record up to four programs at once using a digital video recorder, and the ability to program a DVR remotely through customers' AT&T Yahoo! High Speed Internet account. AT&T is the only provider in Dallas/Fort Worth to offer a 100 percent Internet Protocol based television service, making U-verse TV one of the most robust and feature-rich services available today. AT&T announced the availability of AT&T U-verse OnTheGo, a new service that allow U-verse customers to view live television on a PC using any broadband Internet connection. AT&T U-verse OnTheGo is delivered under an existing agreement between AT&T and MobiTV. AT&T U-verse OnTheGo subscribers can access nearly 30 channels, several of which feature live programming -- including The Weather Channel and Bloomberg Television, among others. In the future, AT&T U-verse OnTheGo will also feature U-verse content such as movie trailers for Video-on-Demand (VOD) content, and AT&T plans to add more channels and content. Clearly not focusing on one region of the country, AT&T announced another launch of AT&T U-verse services in Kansas City. AT&T U-verse services are initially available to those in the Kansas City metro area, including parts of Kansas City, Leawood, Lenexa, Mission, Mission Hills, Olathe, Overland Park, Prairie Village, Roeland Park, and Shawnee. AT&T will continue to increase availability throughout the area on an ongoing basis. With the rollout in Kansas City, AT&T U-verse services are available in parts of 15 markets across six states, with plans to continue expansion into new markets throughout 2007. AT&T announced the launch of AT&T U-verse IPTV services, which utilize AT&T's new fiber network to offer cutting-edge television and high-speed Internet services. AT&T U-verse services are initially available in limited areas across the Dallas-Fort Worth metropolitan area, though the company intends to increase availability throughout the area on an ongoing basis. AT&T U-verse services are available in parts of 14 markets across five states, with plans to continue expansion into new markets throughout 2007. AT&T told the San Antonio news on Wednesday that it is ready for major expansion of its U-verse IPTV service. "We're ready to take our foot off the brake and step on the accelerator," John Stankey, AT&T's group president for operations, said Tuesday. "By the end of the year, we will be up and running in every significantly sized market where we operate." Light Reading has an interesting article on why AT&T has choosen to use standard phonelines (HomePNA) for broadcasting their U-verse IPTV service throughout the home. AT&T ruled out both coax cable (MoCA) and the latest wireless standard, 802.11n, as options for U-verse. As if almost responding to our recent skepticism on rollouts of the U-verse IPTV service, AT&T announced the initial launch of service in limited areas across the Milwaukee and Racine metropolitan areas. AT&T intends to increase availability throughout the area. For those in that area, AT&T has a promotion where new customers can receive two months of free TV with 60-day money back guarantee through June 30. See their website for details. That now places AT&T U-verse services in parts of 13 markets across five states. AT&T now puts the tally at nearly 7,000 U-verse customers in markets across the United States. Is AT&T's U-Verse Going Anywhere? AT&T announced a distribution agreement today to deliver Scripps Networks' programming as part of the AT&T U-verse TV channel lineup. But while AT&T continues to announce new programming agreements here and there, where's the new market announcements? AT&T expects to reach nearly 19 million households by the end of 2008 as part of its initial deployment. AT&T thoroughly defended this projection and strategy during AT&T's fourth quarter earnings conference. At the call, AT&T's CEO Ed Whitacre said, "It works and it works well. The network is good. All of the delays and some of the difficulties we've had are due to programming and we think we're just about to get all of them solved. Everything seems to be working well so this is our plan A and plan A we're sticking with. We like this stuff." However, since late 2006, AT&T hasn't announced any new markets for the U-Verse IPTV service. If only having around 4,000 customers by the end of 2006 wasn't enough for analysts to be skeptical, the lack of announcements is really adding fuel to the fire. At AT&T's fourth quarter earnings call today, chairman and CEO Ed Whitacre provided good news for all those eagerly anticipating U-verse service. He stated that AT&T plans to ramp up deployment of their U-verse service and intends to pass 8 million living units by year-end 2007. Currently, AT&T U-verse services are only available in 11 markets. However, there was mixed news for those in the Bellsouth area. When asked about their video strategy for Bellsouth, AT&T stated the strategy was not yet concrete but they would look to develop that out in the months to come. On a positive note, Whitacre stated that Bellsouth contains a significant amount of fiber plant and they anticipate a quicker rollout compared to the SBC footprint. Once again confirming AT&T's commitment to their network implementation, Whitacre stated, "We're committed to IPTV in a fiber-to-the-node network. It's the right architecture for the long-term. We see it in the field. It works and it delivers to our customers." According to AT&T, the U-verse service has been well received by customers. "Our customer feedback thus far has been very good and in fact, we think it out-performs cable in side-by-side comparisons." AT&T also noted that 70% of their customers are subscribing to higher-end video packages and AT&T's fastest broadband speeds. AT&T's U-verse service was a hot topic during the question period and when asked whether AT&T has a plan B for their video services, Whitacre reasserted, "Our fiber-to-the-node architecture is performing better than we anticipated it would. We're actually seeing better bandwidth then we had forecast. And we're seeing that better bandwidth in both the short and long loop links." He went on, "It works and it works well. The network is good. All of the delays and some of the difficulties we've had are due to programming and we think we're just about to get all of them solved. Everything seems to be working well so this is our plan A and plan A we're sticking with. We like this stuff." "We get lots and lots of questions about U-verse and IPTV," said Chief Financial Officer Rick Lindner at the Citigroup 17th Annual Global Entertainment Media and Telecommunications Conference. "I know there is a lot of concern about whether the product will work--and much of that is centered around [whether] the fiber-to-the-node architecture will work and supply enough bandwidth. The concern is that we will be coming back and announcing a large capital program to take fiber to the home. What I would tell you is that we are pleased with the rollout at this point. We would always like it to go faster--we’re more impatient than all of you here in terms of wanting to see revenue." Read more in Telephony Online. If you haven't already heard, the Federal Communications Commission has approved the $85 billion acquisition of BellSouth by AT&T. The 4-0 vote of approval came Friday after AT&T sent in a modified proposal on Thursday that included a series of major concessions including a network neutrality agreement. In it, AT&T agreed to "maintain neutral network and neutral routing in its wireline broadband Internet access service." The agreement will last for 2 years or until any formal network neutrality agreement legislation is passed. AT&T also included a commitment to rolling out IPTV in the BellSouth region. "AT&T/BellSouth will continue to deploy fiber-based facilities and intends to have the capability to reach at least 1 .5 million homes' in the BellSouth in-region territory by the end of 2007. AT&T/BellSouth agrees to provide a written report to the Commission by December 31, 2007, describing progress made in obtaining necessary authorizations to roll-out, and the actual roll-out of, such advanced video services in the BellSouth in-region territory." AT&T Inc. announced two new locations, the San Jose and San Francisco Bay Area, that can utilize the AT&T U-verse IPTV service. In the Bay Area, U-verse TV services are initially available in limited areas across the San Francisco-Oakland-Fremont area, including parts of the cities of San Ramon and Danville. In the San Jose Area, U-verse will be available in limited areas across the San Jose-Sunnyvale-Santa Clara area, including parts of the cities of Cupertino and Saratoga. AT&T plans to expand to additional areas on an ongoing basis.